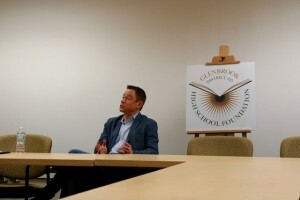 Big Ten Network Lead host and New York Times Bestselling author, Dave Revsine held a press conference at Glenbrook North on Thursday, April 12th in the Green and Gold Conference Room. A 1987 graduate of GBN, Revsine will be the featured speaker at the Foundation evening of “A Night of Glenbrook Theater” on April 28th. Reporters from local papers and student journalists were present to talk with Revsine about his experiences at GBN, ESPN and the Big Ten Network.